This past summer, I was going through a difficult week. I'm generally a positive person, but some less than ideal situations really pushed me. On that Saturday, I stopped by my dad’s house for a cup of coffee and a waffle. Ken Wax has a way of giving very frank pep talks, and I definitely needed one that day. Normally the pep talks consist of putting things into a cold hard reality check with some motivational expressions (always a mark of a great pep talk). He introduced me to the ‘You Are Here’ concept -- and it changed my perspective on life forever. Each lifetime was a completely new you, a fresh take on how you look at the world and what you do with it. The first 20-25 years of your life are generally pre-determined. You don’t have much say for the first 18 years, and even after 18 you generally follow a system - one that college or your parents or society has crafted for 18 years and engrained into your mind. You may feel as if you have a choice, but it’s incredibly hard to break from this mold without getting some form of judgement or push back from the people closest to you. Get an even better job. This is the path, this is the best way to live. And it is a great life, don’t get me wrong. If you’re happy on this path, then you have won. What if you find yourself disengaged along the way? What if you wake up at age 30 or age 40 or age 50 and dislike what you do each and every day? Are you able to change your path? Or are you stuck? The ‘You Are Here’ concept opened up my mind to knowing that you can change, and you can create these different ‘lifetimes’ within your life, you just have to break from the safe path. ...but it’s human nature to go the safe path. The safe path is routed in our DNA to protect us from bear attacks and everything else in prehistoric times. If your body and mind sense uncertainty, whether that be in the forest or in taking a chance, it will always seek the safe path and push us that way. That's why it can be hard to push or motivate yourself to break from the comfort of a routine, or a job you’re good at but don’t love, or any other comfortable scenario in your life. Why can’t I get motivated? We’re hardwired to only see the negative outcome of going a different path, and it quickly senses danger and uncertainty and reroutes us to the comfortable path. It’s hard to change this way of processing the world, but it can be done. What was so powerful about seeing this simple piece of paper, was that I realized I was at the beginning. I could change my path if I wanted to, and I had entire LIFETIMES that were ahead of me. I just needed the mindset and discipline to get there. It pains me when I chat with friends or people I meet at events that are in their late 20s and early 30s that believe their path is just the way it is - it wouldn't be wise or make sense to break from it, especially so late in their life. You went to school for finance, so you’re destined to be a financial analyst, even though you really want to be a park ranger. Or it’s your dream to live in California, but there’s not a lot of jobs in your field there so you can’t do it. I’ve heard this so many times, and it pains me every single time. Here it is again, for maximum impact. Instead, I show them this piece of paper. Even when you hit 40, you still have two more lifetimes you’ll live before you hit 70. You could mess everything up until age 40 and still have time to make the change and be your best self. 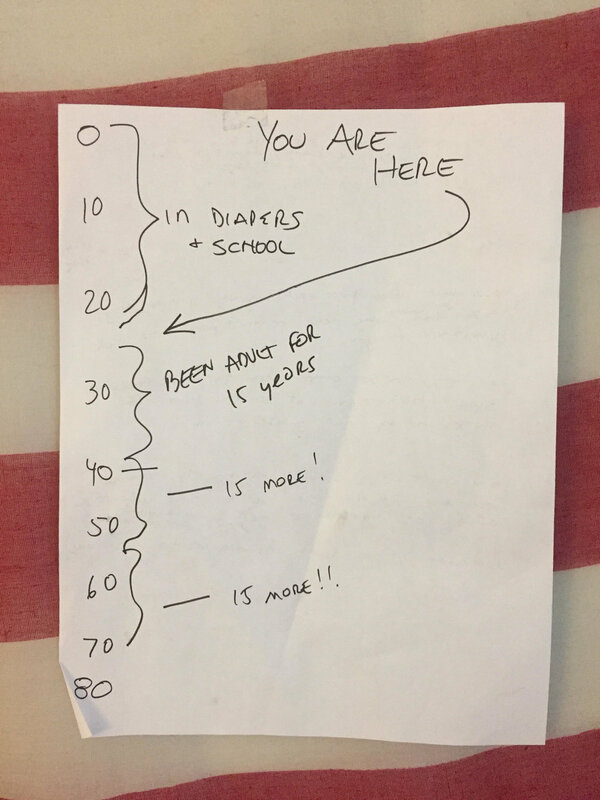 At the end of drawing out the decades, he drew a giant arrow and wrote in all caps ‘YOU ARE HERE’ with an arrow to 27. I highly recommend mapping this out for yourself today, if there’s somewhere you want to be but are feeling discouraged or stuck -- draw out your own ‘You Are Here’ arrow, and realize that you have lifetimes to get it done, you just need to get started. Hang it up, and look at it every day.